Drawing things that people wear with accuracy is a necessary skill to develop for sketch artists and fashion designers. Sketch artists need it for advanced levels of portrait work and fashion designers need it to convey designs they want to bring to creation. If you ever need to portray people in motion such as various types of dancers, draw tap shoes. If you're a student or fan of the dance form, drawing tap shoes allows you to sketch this image onto cards, banners and signs. Draw a horizontal oval in the middle of your paper. These will be the base of the shoe. Draw two vertical lines above the right side of the oval. These will be the part of the leg connected to the tap shoe. 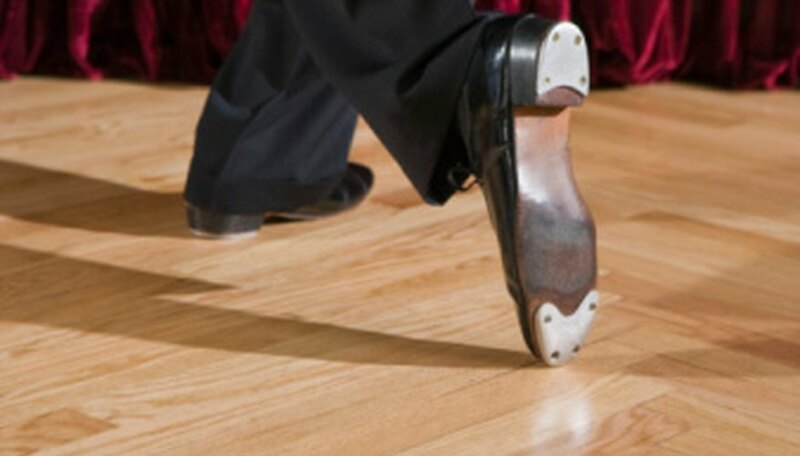 Curve the lines of the legs so they flow organically into the tap shoe. Draw a slight rectangle at the bottom right side of the oval. This will be the heel of the shoe. Make it as large and high or as slight and low as you like. Draw the curved horizontal line that extends from the top-right side of the ankle down and across to the toe of the shoe. This is the top of the shoe and it is the line that distinguishes where the shoe ends and the tap shoe begins. Draw in the details of the shoe. Draw the angled vertical line that acts as the strap. Draw a sliver of a rectangle underneath the heel and toe of the shoe that acts as the tap. Erase all your guiding and overlapped lines. Smooth out the lines you've drawn by going over them and making them more fluid. Repeat this entire process with another horizontal oval, though this time the vertical lines will connect out of the left side of the oval, so that you create the other shoe.